Street sketching is something I'm writing about from personal experience. Back in 1990, I got laid off from a typesetting job only a month after I got hired. I was annoyed at having to start the whole job search process again and that Friday night I looked at the income I had from my self-supporting art hobby and the cost of living in New Orleans. I said "I'm not unemployed, I'm self employed." I had to give it a try. So I went down to the French Quarter and started selling my art in person. I bought a street license for $29 for a year and set up in a historic spot behind St. Louis Cathedral where I had an attractive iron fence to hang my matted, shrink wrapped sketches on, clipped to bungee cords. I lived on street sketching for years until my health gave out and I could no longer physically walk to my setup dragging my cart with my supplies. There is a reason most of the artists you meet are spry, athletic and may be skinny -- it takes some physical energy to stand at an easel and especially to go outdoors to draw, which is what street sketching is all about. The only thing that stopped me was my disabilities. Recently in a news article linked to a discussion on WetCanvas, I read about an artist in New York City who decided after trying to break into major galleries and move in fine art circles to just take his art out into the street. New York didn't have licensing or anything formal about it, so he just carried his oil pastels and supplies out to the swankiest, fanciest famous shops in New York. He set up to draw New York's legendary high life and landmarks. His paintings sold usually before they were finished, in the $500 and up range depending on size and difficulty. He's booked solid with commissions and still just sets up by a lamppost across the street from his latest subjects. The moral of this story? Look around for something local. Look for high traffic areas that are historic and beautiful, places that people would visit just to look at them. Draw them in person. It's important to find out what the local laws and ordinances are for street sketching. Does it need a license? If so, you stand a better chance at success than not because the city is going to have a vested interest in keeping street artists as a tourist attraction and source of revenue. Always charge local tax and hold it back out of your earnings. I used to pay my taxes monthly, had a tax number and the happy perk that I didn't have to pay sales tax on any art supplies or tools I bought while I was doing this. It was all for resale. If you are a gregarious, active person who likes meeting people and enjoys drawing with an audience, street sketching can be lucrative and an emotional high. It's a performance art too. A showoff personality lends itself to street art because you get the kick of direct connection with your audience or subjects. I did portraits, if I were to do it again now I would probably go to doing more landmarks and architectural renderings since I've learned to do those loosely. Use styles and techniques that go fast. Clients and buyers for street art are paying for the experience of seeing real art created in front of their eyes. Their patience runs to about half an hour, at most forty minutes. So practice your trademark subjects until you can render them quickly and hold some conversation during the process. Save any slow meticulous processes for the high end display pieces that they can commission and come back for in a day or a week or three, or have shipped once their project is done. One advantage of street sketching as an entry level art career is that it will train you to fast, accurate sketching. Getting paid for good practice is exhilarating. I recommended daily sketching back in my creativity and drawing articles. While I did street sketching, some days I created 20 or 30 pastel portraits. One week of that in tourist season improved my speed, observation and portraiture skills more than I had ever expected. If you don't live in a tourist city or area, there are still local landmarks that you can explore and render. Bring a plein air setup and something to display finished art on. Work outdoors in good weather and talk to people who stop and ask about it. This lower key version of street sketching can either turn into a familiar place where people know they can find an artist, the beginning of a market, or turn you into a bit of a local celebrity. It can increase your exposure. Be sure to make business cards and hand them out. Many good street artists are also represented in galleries. Local galleries are a good place to start since they naturally will tend to favor local artists. Keep cards or flyers for any gallery that has your art available along with your business cards. If your area has a local farmer's market, this can also be a good place to set up a portraits booth or sell local landmark sketches. Still lifes including local produce may go well at a farmer's market. Other alternatives include local art fairs, which usually take purchasing a booth for a fee but may often get so much business that they are cost effective. Canvas boards are a good choice for oil pastel street sketching as they require no matting or mounts to lean against a fence or set up on a display rack. If you prefer using paper, it's important to buy either precut mats or cut your own mat boards and cut backing boards for your finished works. Archival photo bags are an inexpensive alternative to shrink wrapping, either way it's important to have some way to keep rain and dirt off finished artworks. One item that I would have loved to have down in New Orleans but wasn't aware of till long after those days ended was the Testrite Display Wall available at Blick Art Materials This display wall is reasonably priced at under $150 and would have held everything that I used to display when I hung my art on the fence. It would have given me much more flexibility in where to set up since I wouldn't have been limited to areas that had convenient iron fences. Since many towns and cities don't feature the decorative iron fences New Orleans has, something like the display wall or any kind of display rack may help a lot when bringing your art to the street or to art fairs. For portraiture, I also brought lawn chairs for myself and the sitter, an inexpensive wooden display easel I used as an easel, a small folding table to set up supplies and a beach umbrella on a long pole that went through a hole in the table. Edit as of October 2011: When I moved to San Francisco, I kitted up for street sketching again. A good friend gave me a Testrite Display Wall. I can now wholeheartedly recommend this product. Despite my disabilities, assembling the Testrite Display Wall was easier than getting it out of the box. It's lightweight by itself but a rock bag could easily be improvised to hang from the tripod base in windy areas. 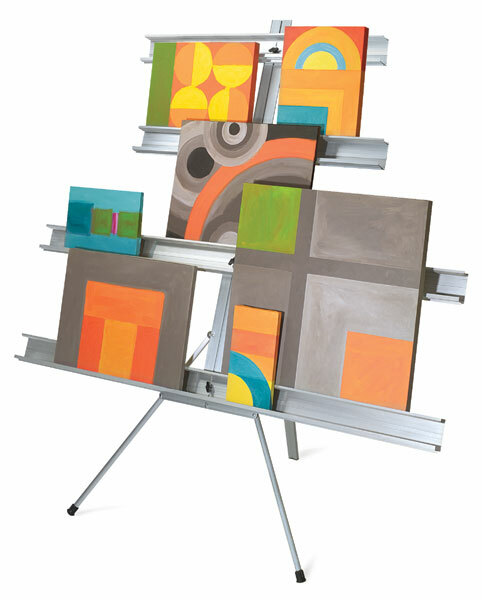 It can also perform double duty as an easel for large reasonably lightweight surfaces like gator board. Shelf height adjusts easily and an extra fastener was included in the box if you either lose one or purchase an extra shelf. It makes a beautiful big display anywhere indoors or outdoors and does break down easily to fit in a canvas bag. Image from Blick Art Materials . A print rack is another way to make still more art or prints of your best works available. These come in many varieties and different brands, in either metal or wood. I linked to one of the less expensive nice wooden ones as an example. Print racks allow you to put out many different pieces for a customer to look through. Always mat and shrink wrap or use archival photo bags on anything that goes in the prints rack. People will leaf through it and smear the art or get dirty fingerprints on it if it's not protected. Wear a broad brimmed hat while street sketching and be sure to use sunscreen. The umbrella is important to shade both you and your client, if the client's sitting in the hot sun for half an hour they'll get sunburned and annoyed instead of carrying away a happy memory of having their portrait done. Often on a hot day the umbrella and chairs attracted tourists who were hot or tired and got to sit down for a little while. Shade is very appealing on hot days! I loaded all that stuff into a wheeled grocery cart that I bought at a local discount store, the folding kind. Other artists built elaborate wheeled carts with wooden cabinets on them designed to hold all their furniture and supplies while also acting as side table and support for the umbrella. How fancy you want to get in designing your art cart or building one depends on how well you do and how much you like doing street sketching. The artists serious enough to have homebuilt cards were the ones who also had a lifelong career earning as much as anyone with a regular skilled job.